My solo exhibition runs till June 05, 2015 so if you couldn't make it last night, no worries, just drop on in at Galerie&Atelier Kunst-werkstatt, Steinstr. 59, 81669 München, during Mo-Fri 11am - 5pm. I'd be delighted to see you. I just finished hanging 21 of my Selected works including new works which will be exhibiting at Merck Finck & Co, Privatbankiers, Marktplatz 3, 82031 Grünwald from January 23 - April 24, 2015. You are welcome for viewing during working hours Mo-Fri 9am to 5pm. Love to hear your feedback! Success! Great Opening Night in Munich! Thanks to all of you who came out and made it a success! If anyone needs 3D glasses, just let me know! It's an awesome way to view many interesting artworks! 12 international artists will be presenting their creative works in the monthly exhibition curated by Inge Schülz, owner of Treffpunkt Kunst. 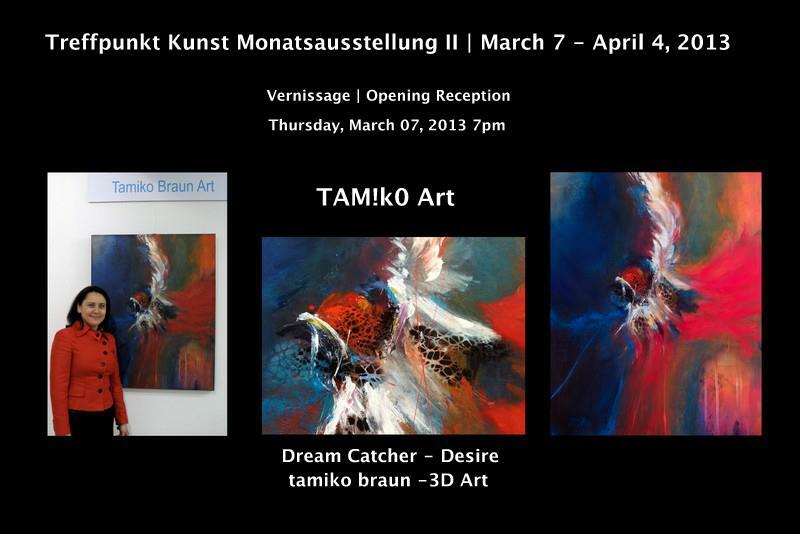 I'll be presenting for the first time my latest work "The Dream Catcher". Hope to see you all there! IN-SIDE-OUT Open House Party - A Success!